Government officials had assured me that I would earn more if I shifted to organic farming. But the yield is lower and we are not getting higher price for it. So there is no real motivation for us,” says Vaibhav Vishwa- karma, a farmer in Madhya Pradesh’s Chhindwara district, talking about the Paramparagat Krishi Vikas Yojana (PKVY). Launched by the Union government in April 2015, the three-year-scheme aims to promote organic farming among small and marginal farmers. India’s organic food sector has so far been restricted to big players because of the National Programme for Organic Production (NPOP), an expensive third-party certification programme that the country adopted in 2001. To bring small and marginal farmers into the mainstream, PKVY has been made participatory: the government forms farmer clusters at the village level, trains them in organic farming and then the cluster members monitor the farms and get certificates under the Participatory Guarantee System (PGS), which the PKVY is promoting. 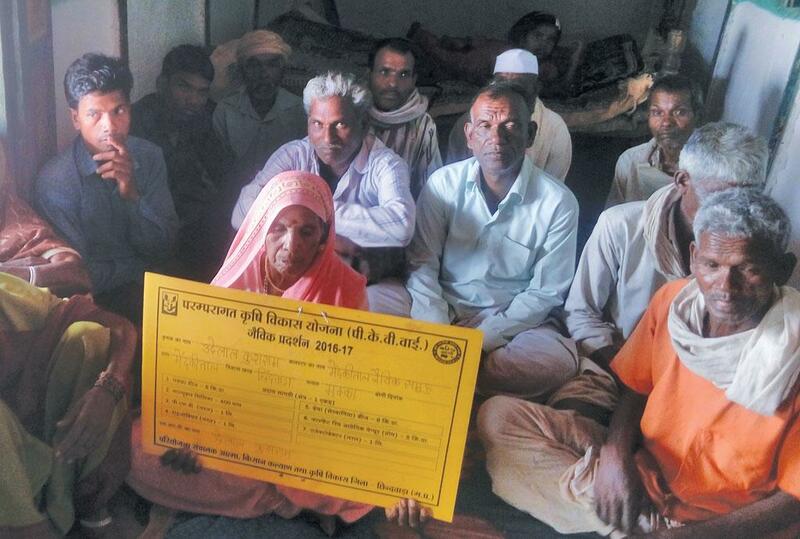 But two years after the launch of the scheme, farmers such as Vishwakarma are fast losing faith in it. The reasons: limited training, poor funding and failure to create a robust domestic market for organic produce, says Delhi-based non-profit Centre for Science and Environment (CSE), which has analysed PKVY’s performance in three states—Madhya Pradesh, Uttrakhand and Uttar Pradesh. In Madhya Pradesh, CSE researchers visited Chhindwara district, where more than 5,000 farmers have been enrolled under the scheme. In Uttarakhand, which is a focus state as PKVY gives preference to hilly states, the researchers visited Dehradun district, where close to 6,500 farmers are covered under the scheme. 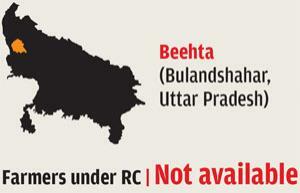 In Uttar Pradesh, where PGS has failed to pick up, the team visited Bulandshahar district. The scheme is implemented by the state agriculture departments, with the National Centre of Organic Farming (NCOF) acting as the secretariat. The state departments select regional councils (RCs) at district level. The councils then form clusters of 50 acres (1 acre=0.4 hectares), preferably one acre per farmer, at the village level. The 2015 PKVY guidelines say RCs will help organise trainings for cluster members and assist in the overall PGS certification, but it has no provision of training the RCs. “We only have experience in farming using chemical fertilisers and pesticides,” says Dheeraj Thakur, assistant director, Agriculture Technology Management Agency (ATMA), the RC in Chhindwara. Interestingly the guidelines, which have been revised as recently as April 2017, still do not have budget for training RCs. 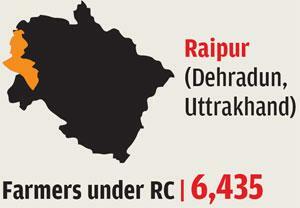 As a result, farmers across the three states say the trainings are theoretical and generic. PKVY guidelines recommend an exposure visit to a model organic farm and three trainings for farmers within the first six months of setting up the cluster. They should train the farmers on different aspects of organic farming, such as raising seedlings and organic seed production, manure and composting, biofertilisers and biopesticides. The RC should also identify one resource person, called the lead resourceful person, from within every cluster, who should be trained on soil sample collection and quality control, certification and packaging, labelling and branding with the help of experts from several institutes.“Mostly trainings are organised with experts from state agricultural universities, and are on general awareness rather than on technicalities. Exposure visits are also limited in number,” says Thakur. Farmers say trainings by NCOF are also general. Krishan Chandra, director, NCOF, justifies the department’s trainings when he says, “Since NCOF has no budget for training under PGS, it has no specific trainings. We conduct trainings on overall promotion of organic farming.” He adds that NCOF can help in capacity building but would need additional funds. Selection of RCs is another problem. The Indian organic movement has for decades been led by individual farmers and non-profits working at the grassroots level. Even though PKVY guidelines say RCs can either be a government body or a non-profit, over 90 per cent RCs are government departments with little experience in organic farming. “Also, non-profits registered as RCs do not easily receive funds from the state government,” says Deepak Pande, chairperson, Society for the Upliftment of Villagers and Development of Himalayan Areas, a non-profit which acts as the RC in Uttarakhand’s Haldwani district. “Organic farming is a scientific area and the country’s farm sector has so far been dependent on chemical fertilisers and pesticides. So we need people experienced in organic farming to train farmers. But experts who are capable of training are not a part of RCs,” says Bharat Bhushan Tyagi, owner, Chetna Vikas Trust, another non-profit that works as RC in Bulandshahar. Members of the RCs also complain that funding is grossly insufficient. Sanjeev Srivastava, quality manager, the Uttarakhand Organic Commodity Board (UOCB), an RC, says a cluster office receives about Rs 20,000 a year for maintenance, which includes rental charges, salary of coordinators and data entry operators, expenses for furniture, computer and stationeries. “Funds allocated under PKVY are insufficient especially for private or non-profit RCs, who usually do not have an existing infrastructure,” says Pande. Yogesh Chopre, assistant technical manager at ATMA, says motivating the resource person is difficult because the guidelines allocate Rs 1,200 a year for the post. “The money is too low to work as an incentive because a resource person has to do a lot of work, which at times leaves him with little time to farm,” says Chopre. Farmers also complain that the scheme provides no financial support for maintaining livestock, which plays an important role in organic farming. For example, cow dung is used as manure. The scheme funds the building of a structure with a capacity to create 16 quintals (1,600 kg) of vermicompost on each farm. Farmers, however, say the incentive is not sufficient. “Thirty quintals (3,000 kg) of vermicompost is needed for 0.4 ha land,” says Udaylal Kusram, resource person, Medkitaal village, Chhindwara. Liquid biofertilisers and biopesticides need to be used along with vermicompost for soil treatment. Farmers also say the scheme does not fund the construction of storage structures. 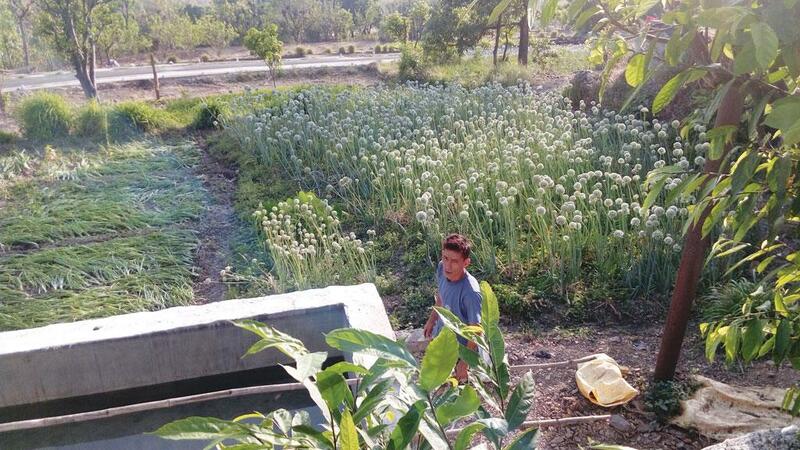 “In the absence of storage structures, vermicompost gets spoiled in extreme heat and rains,” says Fateh Singh Solanki, cluster farmer, Raipur village, Dehradun. Even as stakeholders complain of insufficient funds, the overall funds released to the states for the scheme has dipped from Rs 218 crore in 2015 to Rs 120 crore in 2016—a 45 per cent dip in the budget in just one year. 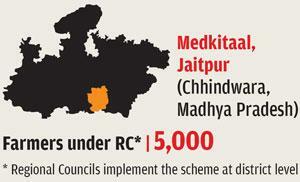 The scheme has allocated Rs 350 crore for the current financial year. Thakur says the scheme’s guideline to provide financial assistance through direct benefit transfer is also a hurdle. “Farmers are too poor to make the initial investment and the money is transferred to the bank accounts only after the structure is made. As a result, only 500 of the planned 5,000 vermicompost units have been made so far in Chhindwara,” says Thakur. For issuing organic certificates, the scheme recommends pesticide residue testing of eight crop samples from each cluster. Experts say this is inadequate. “Eight samples for residue analysis are insufficient as there could be more than eight crops in a cluster,” says Srivastava of UOCB. Besides, NCOF has not received a single test result, confirms Chandra, the institute’s director. When asked why samples have not been collected in Chhindwara, Thakur says, “We do not even know how to collect the samples.” Interestingly, Chhindwara is in the process of issuing PGS-India Green certificates without the sample results. 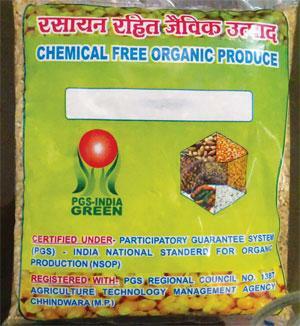 Under the scheme, a certification of PGS-India Organic can be granted after two to three years of organic practice. During this conversion period, PGS-India Green logo can be used. Experts point out another problem when they say the country currently has no standards for pesticide levels in organic food. “Residue testing currently takes place for pesticides for which maximum residue limits are fixed by the Food Safety and Standards Authority of India (FSSAI) for conventional foods,” says Chandra. One of the primary reasons farmers are not excited about organic farming is the government’s failure to create a stable market for the produce. As a result, farmers are forced to sell their organic produce at regular market price. This hurts because farm yield is initially lower in organic farming. Chhindwara has only one store by ATMA to sell PGS produce. “We only sell unprocessed produce at the store at usual mandi rates,” says Shubham Ghagre, salesperson at ATMA’s Jaibhavani Jaivik Sabji Kendra. Mahesh Bhalavi, a resource person at Chhindwara’s Jaitpur village, says the lone store is unable to buy from organic farmers in the area. “So we are forced to sell our produce to middlemen at the rate of non- organic produce,” he adds. Tyagi suggests a direct market for organic produce in the urban centres to address the market problem. Chandra says the scheme should work on popularising organic produce among people. “We have sought Rs 260 crore for 2017-2020 for developing e-market and residue analysis for PGS,” says he. Another fundamental problem is that a PGS produce can be processed and sold as PGS-certified only if it is processed under the supervision of cluster members or by a “duly authorised federation”. “This is a major bottleneck in Chhindwara since none of our clusters has processing units and if we associate with external unit for processing, we cannot market it as PGS,” says Thakur. The Indian organic movement can only flourish if it involves small farmers and domestic consumers. Therefore, in principle, PGS is a step in the right direction. However, there are big gaps in its scale, design and implementation, which if not addressed, can render the scheme ineffective. PKVY must aim to make organic food a “norm” and not remain an “exception” in India. This can happen only if more farmers adopt organic and more people buy organic. There is a need for large-scale reform in the organic farming system in the country. PKVY, which is currently a component of the Soil Health Management under the National Mission for Sustainable Agriculture, should be an independent mission with necessary administrative and accountability mechanisms. It should also have a long-term vision and plan with aggressive targets and adequate funding. The current target of about 200,000 ha is too small for a country like India which has over 140 million ha of net sowing land. A budget of few hundred crores of rupees is minuscule to make “organic” a mass movement, specially when the annual subsidy on chemical fertilisers is more than Rs 70,000 crore. PKVY should adequately focus on training with respect to budgets, specific skills and demonstrations and involve expert farmers for large-scale structured interventions. The scheme should ensure adequate support for off-farm and on-farm inputs for effective conversion to organic farming practices without risking yields. It must push for pesticide residue testing, which will give the necessary weightage to product testing aspect of the certification. The Union agriculture ministry must also work towards providing assured markets for PGS produce. This will involve more physical stores, electronic platforms, but, most importantly, it should enable procurement for mid-day meals, public distribution schemes, railways, airlines and other government institutes. In addition, provisions should be made to enable the sale of PGS produce in other countries. To develop long-term expertise, it should make organic farming a part of curriculum in agriculture colleges. Meanwhile, FSSAI should set the standards for pesticide residues in organic foods and ensure surveillance. Labelling provisions should be introduced based on compliance with organic process and pesticide testing in products. The success of the scheme becomes extremely imperative in the light of FSSAI’s recent Draft Food and Standards (Organic Food) Regulations. The March 2017 draft mandates compliance with third-party certification or PGS certification for a processed food item to be labelled “organic”. In fact, if the draft becomes a law, it is likely to do more harm than good to the Indian organic movement as there is limited local market for organic produce and small farmers are likely to opt out of the organic farming practices. It is a very correct analysis of the organic agriculture and the certification in the country. It benefits big players and rich consumers. It is the. Average Consumers who need to be made aware of the importance to buy pesticide free food to increase the markets. Multiplicity of institutions too creates problems and the trainers are I'll equipped with ecosystem management knowelde and mostly inaccessible to small growers.These cultivation ptractices need a constant monitoring by the growers and the Expert as decesion making is sight specific and not a rigid package as organic cultivation is being made out to be, as has been the practice with conventional practices. This is too early to have such comments. Of course the funds are not sufficient for a NGO to run as RC. But it seems to be designed for operation at govt level. Convergence works are open for PKVY, which needs to be spread like structure for Vermicompost , Gokul mission, land development through NREGA etc etc.